Hi guys, newbie here trying to get a kart ready for some test laps for my son. I’ve been going over the kart bit by bit to make sure it’s ready (used kart), and one thing has me very concerned. When the steering wheel is turned hard left, the tie rod is rubbing the brake rod. Problem is, I can’t figure out how to solve the issue. I’ve attached a photo hoping someone might be able to help. Thanks! There’s no problem. If the driver has to turn the wheel more than 10 degrees, it’s either pouring rain or he’s gotten it VERY sideways. Thank you, Charles. Being very new to this I just wanted to make sure there wasn’t something severely wrong! I appreciate your help! insufficient engagement with the track rod. The inner heim at the steering column appears to have more than enough. I would suggest that you equalise the amount each joint screws into the track rod. 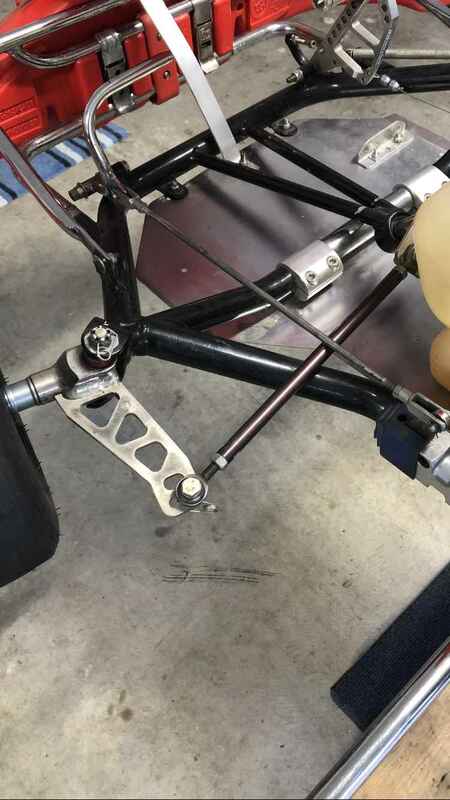 This will involve unbolting the track rod from the steering arm on the stub axle/ spindle . You will need to reset the ‘tracking’ toe in or out of the front wheels. agreed! I’ve had tie-rods back out on track due to insufficient insertion depth; it’s no fun.